Designed in late Streamline Modern style by the firm of Thalheimer & Weitz, the Devon Theater opened in 1946. This originally nearly 800-seat movie house was located on Frankford Avenue near Barnett Street. 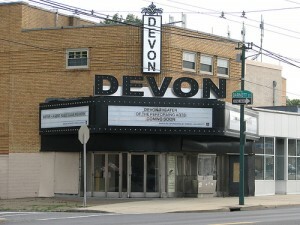 In early 2000 the Devon Theater closed but is currently in the process of being renovated for use as a performing arts center. The Devon Theater for the Performing Arts is set to open in spring of 2009.